Call for the paper: The manuscript be submitted with Before-submission checklist and copyright transfer form to the journal (journal_apiculture@naver.com), then will be systematically reviewed by the journal’s reviewing policy. Manuscripts that do not meet the general criteria or standards for publication in Journal of Apiculture will be immediately returned to the authors, without detailed review. The Journal follows ethical guideline, Guidelines on Good Publication Practice by the Committee on Public Ethics (COPE). Original manuscript would go through more than 2 peer review process. Manuscript which was accepted will be assigned proper date and order for the publication by the editorial board. The journal charges for the publication of 150 USD for a paper within 15 pages. Authors from developing countries could be waivered for the charge. Express publication charges 300USD. ASK retains the exclusive copyright to reproduction and distribution of the Journal publication. When used, JA, the authors are to be properly cited. 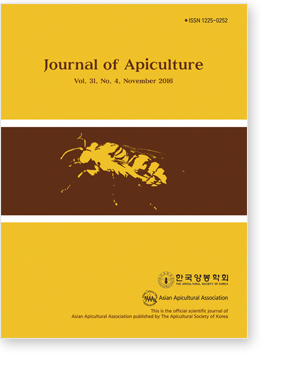 Subscription of the journal printed volume is 50,000 KRW per year and online contents are freely available from http://journal.bee.or.kr . Total or parts of the articles are abstracted in DOI/Crossref, RISS, Google Scholar, DBpia and KCI. The Journal follows an open access policy with xml (http://journal.bee.or.kr). The journal is partly supported by the Korean Federation of Science and Technology Societies Grant, MEST, and Korean Research Foundation. The journal is printed by JY Publishing Group. 5. Pollinator Visit, Characteristics of Secreted Nectar and Analysis of Nectar Sugar and Amino Acid Contents in Flower of Dendropanax morbifera Lev.